I listened to this as an audiobook and I enjoyed it very much. The story was told in two parts, one describing a boy who lived with a mother more interested in ghosts than in her own son, because of her feeling an obligation to the family and their generation long tradition. She sees the ghosts when the comets come. Then there is Roisin who loves astrology and the comets and who wants to see the entire magical world, but she is in love with a boy in Ireland who doesn’t want to leave the farm. There is also some extra complication to her love, that provides extra interest. 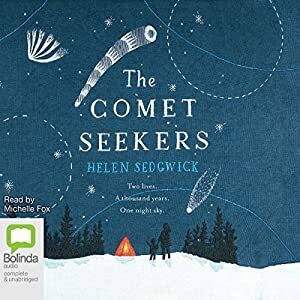 Then there are my favourite sections of the book, the comet parts that intersperse the narrative and serve as manifold metaphors and analogies: comets as companions, returning objects and people, special events, magic and the unexplicable. There is much to enjoy in this, although the back and forth between the characters did wear off at some stage for me and for a while I wasn’t always sure of the direction of the novel, so much I wanted it to come to the point quicker. It all comes together nicely, however, and is very enjoyable a read. Roisin and François first meet in the snowy white expanse of Antarctica. And everything changes. While Roisin grew up in a tiny village in Ireland, ablaze with a passion for science and the skies and for all there is to discover about the world, François was raised by his beautiful young mother, who dreamt of new worlds but was unable to turn her back on her past. As we loop back through their lives, glimpsing each of them only when a comet is visible in the skies above, we see how their paths cross as they come closer and closer to this moment. Theirs are lives filled with love and hope and heartbreak, in a story that shows how strangers can be connected and ghosts can be real, and the world can be as lonely or as beautiful as the comets themselves. Thanks for this very mindful review, Christoph. It sounds like a fascinating read. Good luck to Helen. Hugs all around. Ireland, you say? I like the sounds of this! Nice, thorough review, Christoph. I especially like your honesty in writing about its weaker point, for anyone can trust a book reviewer who gives all sides. Well done!